Join the APWA-MN Chapter for the 2014 Congress Chapter Dinner at the Amsterdam Brewhouse on August 19. 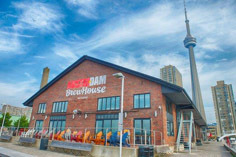 The Amsterdam Brewhouse is a 14,000 square-foot brewery, restaurant, and retail space located at 245 Queens Quay West, with killer views of Lake Ontario from four giant patios and an encyclopedic selection of beers. The Amsterdam Brewhouse is within walking distance of the Congress hotels and is nestled on the shores of Lake Ontario adjacent to the Harbour Centre’s 10-acre site, which provides visitors an opportunity to shop, dine, enjoy a show or other performances ,or even take a leisurely stroll along the water’s edge. The food for the evening will be a buffet-style offering of cold, simple and Caesar salads, Charcuterie display, salsa, and guacamole with fresh corn tortilla chips. Also being served will be hot sliders and mini fish and chips in a cone along with an assortment of gourmet desserts and squares. Two beverage tickets are included with the dinner. Please join us for a memorable evening on the lake for great food, good friends, and a lot of fun! RSVP by completing this form (pdf) and including payment of $50 per person to Pat Schutrop, Chapter Assistant. Checks should be made payable to APWA-MN Chapter. Registration is closed.